Pictures and image of the exterior ruins of Palmavera prehistoric Nuragic village and Nuraghe tower archaeological site, middle Bronze age (1500 BC), Alghero, Sardinia. 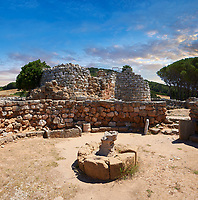 The Nuragic archaeological site of Palmavera is situated between Alghero and Porto Conte bay. 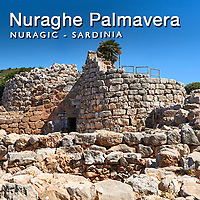 This was an important trading route in Nuragic times and Palmavera became one of the most important Nuragic villages in northern Sardinia as out pictures and images show. The Nuragic village of Palmavera was built between the 15th and 9th century BC and was abandoned around the end of the 8th century BC. At the centre of Palmavera Nuragic village is the tower of a Nuraghe, a fortified high tower that has fortified walls that linked to a second tower. The bastion wall has a door in it which links to an inner protected courtyard off which are the entrances of the defensive towers. Inside the tower are 3 meter high chambers with ogive vaults from which a staircase goes up to the upper rooms of the Nuraghe tower. Next to the main Nuraghe tower ruins are the ruins of a circular stone building with a central plinth that would once have held a high stone model of the Nuraghe that would in turn have supported roof timbers covered in a turf and thatch roof. This room was some sort of communal room possibly for meetings. Around the central Nuraghe at Palmavera are the ruins of 40 round huts. The round stone wall of the huts have a single entrance. The walls of the huts would have supported roof timbers and thatched roofs. 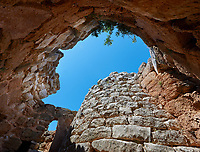 The pictures and images in out Palmavera photo gallery show the ruins of the Nuraghe from the outside and inside. Pictures also show images of the round hut village with the Nuraghe tower ruins behind. Pictures and images of Palmavera Nuragic village and Nuraghe can be downloaded as stock photos and bought as photo art prints on line. If you wish to visit Palmavera Nuragic village follow this link for opening times and site details.